Yes, it's FO time! This here is my Trillian Skandal shawl that I had started in June, finished in July, and didn't get around to blocking until September. Don't be fooled by the slow blogging time on this project, this pattern is actually an extremely easy knit. Even boring at times. Yet it is great when you just want to knit but don't have the concentration for anything that involves thinking. This is an especially wonderful pattern to knit when you've got to keep a watchful eye on a mischievous toddler! When I first started knitting this I wasn't 100% sure about the colourway and thought maybe it was the wrong choice for the pattern. Keep in mind that I've only recently started knitting with variegated yarns in something other than socks and baby items. Variegated yarns scare me a little, in the sense that I can't tell how the colours will work up...will it pool? Flash? Be too busy? Would the pattern's details get lost in the variegation? Yeah, variegated yarns are much too unpredictable for this knittin' kitten. I can never picture how a garment or shawl is going to look in a variegated colourway, unlike with semi-solids or tonals where I can drape the skein around my neck and get a general idea of whether colour and pattern will mesh the way I see it in my head. I was also a little hesitant about how bold these colours were. Yes, the colours together looked absolutely gorgeous in skein form but once I started knitting I started to get the sweats. Weird, considering I love colour. But this colourway is quite the statement, don't you think? At the same time, I couldn't stop knitting. I was completely fascinated with the pattern that I was getting. 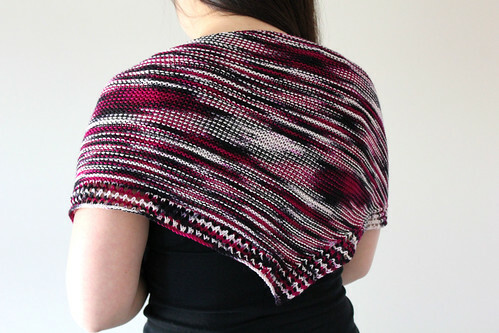 Now I can see why Wollmeise is such a popular choice for planned pooling projects! Definitely captivating. And this shawl is definitely something that should accessorize a monotone outfit! This is my second time knitting with Wollmeise, and I must say this yarn blocks beautifully. I'll admit that I'm a very aggressive blocker, especially when it comes to lace. Sometimes I worry that I'll snap my blocking wires in half, that's how aggressive I can get. I knew I wanted to overly stretch out the lace border this time though cause during the first quarter of the shawl my tension was a bit tight, even though I knew I shouldn't be tugging at the yarn during the lace pattern. I had to keep reminding myself to knit loosely. Luckily the blocking really helped to open up the lace edge. I was also a little worried that this shawl wasn't going to be as big as I would like it to be, but after blocking it has become the perfect size. I was pleasantly surprised that the colours didn't bleed at all too. For such saturated colour I was expecting a slight tint of red in the bath water. Nope. No luck. Makes me wonder even more what Claudia's secret is! I thoroughly enjoyed knitting this pattern up. There's nothing better than mindless garter stitch when you're completely exhausted at the end of the day. Or when you've been dealing with a grumpy toddler who's been having a really bad day and has been in time-out more times than you can count. This is my second time knitting a Martina Behm pattern and it certainly won't be my last. I think she's an absolute genius and her patterns are so cleverly constructed. As with Lintilla, this shawl is also asymmetrical and is knitted up until you have a certain percentage of yarn left before carrying on to the border. That way you use up as much of your yarn as you possibly can AND you can use any yardage that you have on hand. 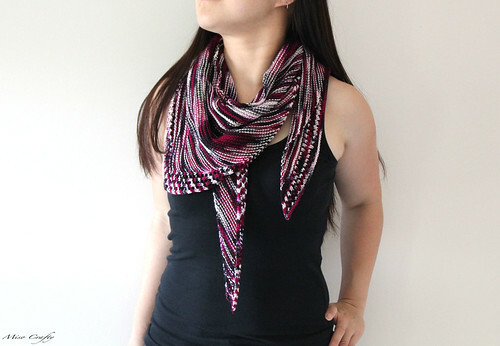 Pattern: Trillian by Martina Behm of Strickmich! I love that last photo, you can really see the effect of the pooling. Looks great!